The light fixtures in your foyer or entryway are extremely important, as they provide light for people as they enter or exit your home, as well as give guests a glimpse of your design and decor styles. 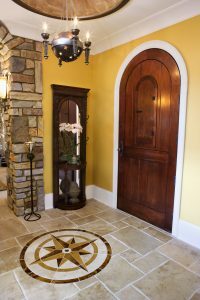 If they foyer is too dark, people may have trouble safely entering your home, and if it’s too bright, it can take their eyes too long to adjust to the change, making them miss your specifically chosen wall color and decor. At Hacienda Lighting in Scottsdale, we have an amazing selection of foyer and entryway lighting, including chandeliers, sconces, and much more. It may seem obvious, but the ceiling fixture in your foyer acts as the focal point for the entire space. If the ceiling extends to the second floor, or there’s a staircase leading from the entryway to the next floor, a chandelier can be a perfect choice. The right chandelier will depend on the complete dimensions of the foyer, as well as your personal preferences and budget. If the foyer has a low ceiling or you have a one-story home, a flush or semi-flush fixture may be a better option. While a chandelier can provide adequate light for a large foyer, only about half of its light will reach the lower portion of the room. Adding wall sconces and other accent lighting will make it easier for people to hang up their coats, find the powder room, and see as they make their way to the other parts of the house. Additional lighting will also make your home feel more inviting. If you want to update the lighting in your foyer or entryway, come to Hacienda today. We have both residential and commercial lighting options, and would love to help you find your new fixtures! The exterior of your home is the first impression that reveals your design style. Safely light it up, and give it some flair. With a combination of form, function and design, our collection of ceiling fans fit any decor and budget. Create a home that reflects who you are by choosing home accessories that represent your style and interests. LED lighting is the future. Find a growing number of decorative pieces and specialty items that offer cost savings, longer life and lower heat generation.